Satisfy your inner culture vulture at Royal Palace of Madrid and Plaza Mayor. Get some historical perspective at Catedral Primada and El Transito Synagogue and Sephardic Museum. When in Madrid, make a side trip to see Monastery of San Juan de los Reyes in Toledo, approximately 1h 30 min away. The adventure continues: examine the collection at Prado National Museum, steep yourself in history at Casa de Campo, walk around Retiro Park, and browse the eclectic array of goods at Mercado San Miguel. To find maps, more things to do, ratings, and more tourist information, use the Madrid road trip site . Porto Seguro, Brazil to Madrid is an approximately 21-hour flight. The time zone difference moving from Brasilia Time to Central European Time is 4 hours. When traveling from Porto Seguro in July, plan for somewhat warmer days in Madrid, with highs around 40°C, while nights are about the same with lows around 23°C. 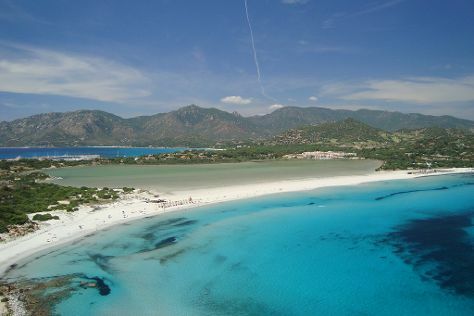 Finish up your sightseeing early on the 27th (Sat) so you can travel to San Teodoro. 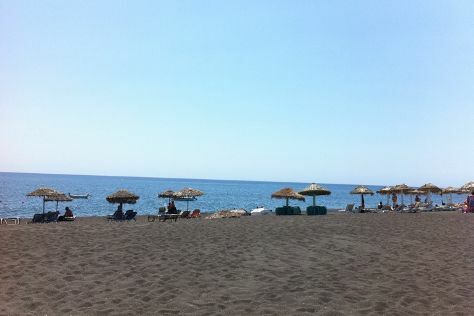 Start off your visit on the 28th (Sun): tour the pleasant surroundings at Spiaggia Capo Coda Cavallo, enjoy the sand and surf at Spiaggia Salina Bamba, and then kick back and relax at Spiaggia del Dottore. On the next day, explore the historical opulence of Castello della Fava, then stroll through Spiaggia Berchida, and then kick back and relax at Lu Impostu Beach. To find where to stay, reviews, maps, and other tourist information, read San Teodoro travel itinerary planner. Traveling by flight from Madrid to San Teodoro takes 6 hours. Alternatively, you can do a combination of car and ferry; or do a combination of bus and ferry. When traveling from Madrid in July, plan for a bit cooler days and about the same nights in San Teodoro: temperatures range from 37°C by day to 22°C at night. Finish your sightseeing early on the 29th (Mon) to allow enough time to drive to Baunei. Baunei is a comune (municipality) in the Province of Nuoro in the Italian island of Sardinia.GeographyThe municipality of Baunei is located about 100km northeast of Cagliari and about 11km north of Tortolì. Start off your visit on the 30th (Tue): kick back and relax at Piscine di Venere, kick back and relax at Cala Mariolu, and then admire all the interesting features of Maschera di Pietra. Here are some ideas for day two: kick back and relax at Cala Biriala, enjoy the sand and surf at Cala dei Gabbiani, and then explore the striking landscape at Il Monolite di Pedra Longa. For photos, more things to do, maps, and tourist information, use the Baunei trip planner . Getting from San Teodoro to Baunei by car takes about 2 hours. Other options: take a bus. In July, plan for daily highs up to 36°C, and evening lows to 25°C. Cap off your sightseeing on the 31st (Wed) early enough to go by car to Villasimius. On the 1st (Thu), do a tasting at Colline del Vento, enjoy the sand and surf at Spiaggia di Porto Sa Ruxi, then tour the pleasant surroundings at Porto Giunco, and finally take in panoramic vistas at Torre di Porto Giunco. Get ready for a full day of sightseeing on the next day: stroll through Simius Beach, then make a trip to Spiaggia di Sant'ELmo, and then stroll through Spiaggia Piscina Rei. For ratings, more things to do, reviews, and other tourist information, read Villasimius route builder site . Getting from Baunei to Villasimius by car takes about 2 hours. Other options: take a bus. In July, daily temperatures in Villasimius can reach 39°C, while at night they dip to 22°C. Wrap up your sightseeing on the 2nd (Fri) to allow time to travel to San Vero Milis. San Vero Milis is a comune in the Province of Oristano in the Italian region Sardinia, located about 100km northwest of Cagliari and about 13km north of Oristano. 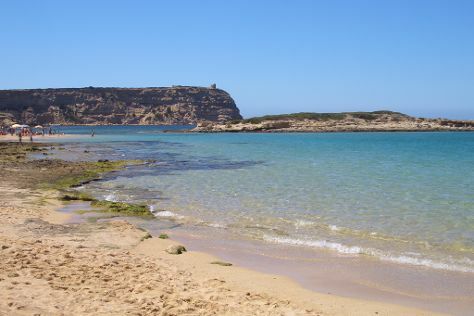 On the 3rd (Sat), kick back and relax at Sa Mesa Longa, then stroll through I Gatti di Su Pallosu, and then enjoy the sand and surf at Spiaggia dell'Arco. On the next day, explore the ancient world of Nuraghe Losa, explore the ancient world of Pozzo e Villaggio Nuragico S. Cristina, take in the spiritual surroundings of Santuario di Nostra Signora di Bonacattu, contemplate in the serene atmosphere at Chiesa di Santa Maria, then pause for some serene contemplation at Parrocchia Maria Immacolata, and finally steep yourself in history at S'Archittu. To see maps, traveler tips, ratings, and tourist information, read our San Vero Milis online trip builder . You can drive from Villasimius to San Vero Milis in 2.5 hours. Finish your sightseeing early on the 4th (Sun) so you can drive to Alghero. Kick off your visit on the 5th (Mon): Head underground at Capo Caccia, look for all kinds of wild species at Wildlife Areas, and then enjoy the sand and surf at Spiaggia di Maria Pia. Get ready for a full day of sightseeing on the 6th (Tue): tour the pleasant surroundings at Spiaggia Mugoni, then contemplate the long history of Basilica San Gavino, then make a trip to Nuraghe Sant'Antine, and finally contemplate in the serene atmosphere at Santa Trinita di Saccargia. To find ratings, traveler tips, maps, and tourist information, refer to the Alghero online journey planner . Traveling by car from San Vero Milis to Alghero takes 2 hours. In August, plan for daily highs up to 37°C, and evening lows to 20°C. Finish your sightseeing early on the 6th (Tue) to allow enough time to travel to Fira. Start off your visit on the 7th (Wed): kick back and relax at Perivolos, kick back and relax at Perissa Black Sand Beach, then delve into the distant past at Akrotiri, and finally do a tasting at Gaia Winery. On the 8th (Thu), you'll have a packed day of sightseeing: examine the collection at Museum of Prehistoric Thera, explore the ancient world of Ancient Thera, then do a tasting at Santo Winery, and finally indulge your senses at some of the top wineries in the area. To find photos, more things to do, ratings, and tourist information, use the Fira holiday planner . Fly from Alghero to Fira in 9 hours. Alternatively, you can do a combination of flight and ferry; or do a combination of train and flight. Traveling from Alghero to Fira, you'll lose 1 hour due to the time zone difference. Traveling from Alghero in August, plan for a bit warmer nights in Fira, with lows around 28°C. Cap off your sightseeing on the 8th (Thu) early enough to travel to Istanbul. On the 9th (Fri), take an in-depth tour of Kariye Museum (The Chora Church), contemplate in the serene atmosphere at Sultan Ahmed Mosque, then take an in-depth tour of Hagia Sophia Museum / Church (Ayasofya), then take an in-depth tour of Topkapi Palace, and finally contemplate in the serene atmosphere at Suleymaniye Cami . On the next day, take a stroll through Ortakoy, delve into the distant past at Basilica Cistern, then wander the streets of Sultanahmet District, then hunt for treasures at Kapali Carsi, and finally take in panoramic vistas at Galata Tower. To find more things to do, where to stay, reviews, and more tourist information, read our Istanbul journey site . You can fly from Fira to Istanbul in 6.5 hours. Alternatively, you can do a combination of ferry and car; or do a combination of ferry and bus. Due to the time zone difference, you'll lose 1 hour traveling from Fira to Istanbul. In August, plan for daily highs up to 34°C, and evening lows to 25°C. Wrap up your sightseeing on the 10th (Sat) early enough to travel to Berlin. 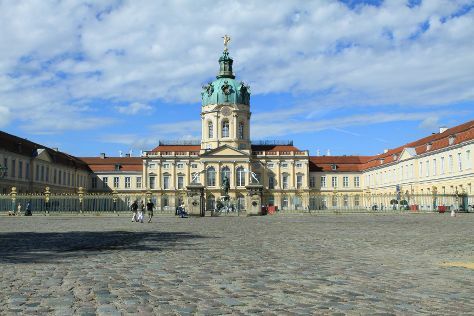 Start off your visit on the 11th (Sun): pause for some photo ops at Brandenburg Gate, explore the historical opulence of Charlottenburg Palace, then ponder the world of politics at Reichstag Building, and finally admire the masterpieces at Pergamonmuseum. On your second day here, steep yourself in history at Memorial of the Berlin Wall, steep yourself in history at Bebelplatz, then make a trip to East Side Gallery, then take in the local highlights with Walking tours, and finally examine the collection at Topography of Terror. To see where to stay, photos, and more tourist information, refer to the Berlin route planner. Traveling by flight from Istanbul to Berlin takes 6.5 hours. Alternatively, you can do a combination of shuttle and flight; or drive. The time zone difference moving from Eastern European Time to Central European Time is minus 2 hours. Finish up your sightseeing early on the 12th (Mon) so you can travel to Paris. Kick off your visit on the 13th (Tue): admire the landmark architecture of Cathédrale Notre-Dame de Paris, then admire the masterpieces at Musee d'Orsay, then appreciate the history behind Arc de Triomphe, and finally steep yourself in history at Eiffel Tower. On the 14th (Wed), you'll have a packed day of sightseeing: contemplate the long history of Basilique du Sacre-Coeur de Montmartre, get a taste of the local shopping with Champs-Elysees, then explore the world behind art at Louvre Museum, and finally explore the different monuments and memorials at The Catacombs of Paris. To find photos, ratings, reviews, and other tourist information, go to the Paris trip itinerary planning website . You can fly from Berlin to Paris in 5 hours. Other options are to take a train; or drive. In August in Paris, expect temperatures between 29°C during the day and 16°C at night. Finish your sightseeing early on the 14th (Wed) to allow enough time to travel to Porto. Bom Jesus do Monte and Centro Historico de Guimaraes are good opportunities to explore the local culture. Visit Santuario de Santa Luzia and Igreja de Santo Ildefonso for their historical value. Explore the numerous day-trip ideas around Porto: Praia de Miramar (in Arcozelo) and Praia da Arda (in Afife). Dedicate the 16th (Fri) to wine at some of the top wineries in the area. There's still lots to do: contemplate in the serene atmosphere at Porto Cathedral (Se Catedral), contemplate the waterfront views at Rio Douro, get into the urban bustle at Palacio da Bolsa, and take in the views from Ponte de Dom Luis I. For more things to do, other places to visit, and more tourist information, read Porto trip planning site . Traveling by flight from Paris to Porto takes 5.5 hours. Alternatively, you can do a combination of shuttle and flight; or drive. The time zone changes from Central European Time (CET) to Western European Time (WET), which is usually a -1 hour difference. In August, plan for daily highs up to 28°C, and evening lows to 17°C. Finish your sightseeing early on the 18th (Sun) to allow enough time to travel back home.